Unlike the other Vietnam motorbike tours from Hanoi, this trip starts from Hoi An – the ancient town in Central Vietnam. The motorbike ride becomes more and more interesting day after day and it’s suitable to the ones who travel Vietnam by motorbike from South to North Vietnam; besides, It offers almost great view of the Vietnam beauty, Vietnam history and Vietnamese culture. Day 1 : Hoi An Motorbike Tour to Hue – 160 KM. In the morning we will have one of the best motorbike tours on coastlines in central Vietnam, we will motorcycle easily up to Da Nang on the coastal road. Then we will go up on the famous Hai Van Pass – the pass offers us plenty of chances for photos. Lunch is after the pass. After lunch, We will have enjoyable motorbike tour inside the countryside of Vietnam, we will motorcycle all the way to Hue on the small countryside roads to see markets, rice fields and plenty of colorful tombs. We will be in Hue at 4 PM. Hotel stay. Day 2 : Discover The Charm of Hue City. Day 3 : Hue Motorcycle Trip– Vinh Moc Tunnel – Khe Sanh – 170 Km. Today we get ready to have motorbike tour on Ho Chi Minh Trail. After Hue city we will head up to the DMZ to see some famous historical relics and learn more about the Vietnam war. Especially, visiting the Vinh Moc tunnel complex extremely gives you special feeling about life, war and peace. After that we take a motorbike ride to the west to Khe Sanh, before getting to the hotel we will have a visit Khe Sanh Military Base to understand how violent the war was. Hotel stay in Khe Sanh town. Vinh Moc (Vịnh Mốc) is a tunnel complex in Quang Tri, Vietnam. During the Vietnam War it was strategically located on the border of North Vietnam and South Vietnam. The tunnels were built to shelter people from the intense bombing of Son Trung and Son Ha communes in Vinh Linh county of Quang Tri Province in the Vietnamese Demilitarized Zone. The American forces believed the villagers of Vinh Moc were supplying food and armaments to the North Vietnemese garrison on the island of Con Co which was in turn hindering the American bombers on their way to bomb Hanoi. The idea was to force the villagers of Vinh Moc to leave the area but as is typical in Vietnam there was nowhere else to go. The villagers initially dug the tunnels to move their village 10 metres underground but the American forces designed bombs that burrowed down 10 metres. Eventually against these odds, the villagers moved the village to a depth of 30 metres. It was constructed in several stages beginning in 1966 and used until early 1972. The complex grew to include wells, kitchens, rooms for each family and spaces for healthcare. Around 60 families lived in the tunnels; as many as 17 children were born inside the tunnels.…. Day 4 : Khe Sanh – Phong Nha – Ke Bang National Park– 220 km. Today is the highlight of the tour. 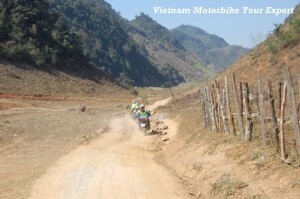 We surely will have the best motorbike tour on Ho Chi Minh trail. 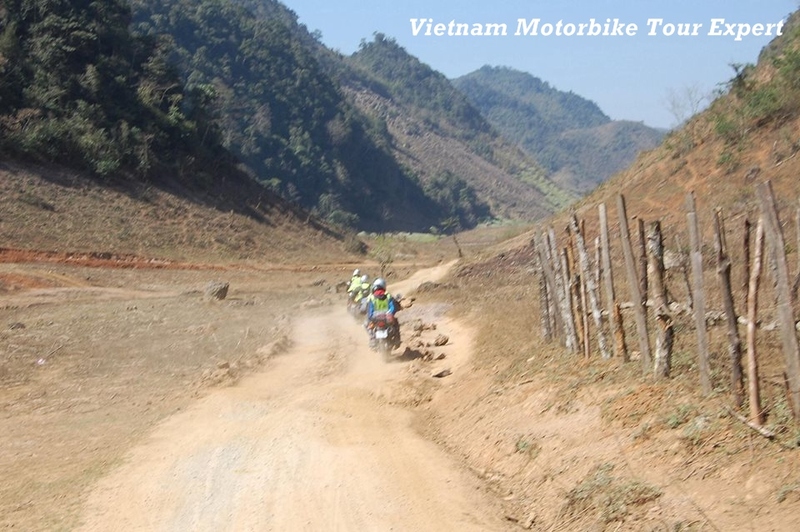 As an Expert for Vietnam motorbike tours, we chose to ride motorbike on the western Ho Chi Minh trail, with 220 km in length the motorbike ride today offers you amazing views of the Phong Nha – Ke Bang National Park especially there are just few other traffics on the trail. Arrive in Phong Nha at 4.30 Pm. If the weather permits, we will take a short boat trip to the some beautiful caves of Phong Nha. Overnight in Phong Nha – Hotel stay. Day 5: Phong Nha – Tan Ky – 270 km. The morning motorbike ride is up to the north of the Phong Nha – Ke Bang national park, The motorcycle ride on Ho Chi Minh trail today keep offering a great view of the limestone mountain and the beautiful villages of the hill tribes. After lunch, we will have smooth motorbike ride straight to Tan Ky – Nghe An province. Overnight in Tan Ky town – Hotel stay. After breakfast, keep enjoying motorbike tour on Ho Chi Minh road until Ngoc Lac town where we stop for lunch. Then we will take a turn to the western mountainous area of Vietnam. From here we will have great Vietnam motorbike tour on the mountain passes and enjoy the differently beautiful view from the days before. We ill be in Mai Chau valley at 5 PM. Overnight in Mai Chau – home stay with the Thai people. Day 7: Mai Chau Motorbike Tour to Hanoi. 170 KM. Before having a motorbike ride to Hanoi, we take a short walk around the valley to visit some villages of the Thai people to learn more about Vietnamese culture and enjoy the peace of the green valley Mai Chau. We will start the tour back to Hanoi at 10 AM, after have an enjoyable motorbike ride on mountains of north Vietnam, we will have lunch in Hoa Binh town. 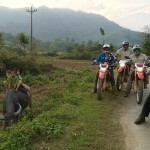 Then hit the road back to Hanoi, finish the 7 day Vietnam motorbike tour on Ho Chi Minh trail safely before rush hours. Short Motorcycle Tour to Ba Be Lake – 4 Days.